The 1597 Sacrae Symphoniae is a monumental collection reflecting the earlier part of Giovanni Gabrieli’s work as an organist of St?Mark’s Cathedral in Venice. Kyrie Eleison is transcribed and transposed to D-flat in this publication. The first and second trombone quartets perform the vocal parts, while the third quartet plays the piffari parts. The score and parts are neatly notated with editorial dynamic markings and some articulations. The tenor trombone parts are numbered 1 through 9, while the three bass trombone parts are listed 1, 2 and 3. Tenor clef is used in the first two trombone parts of each quartet, while bass clef is given for the third and bass trombone parts. The performance level is medium in difficulty. 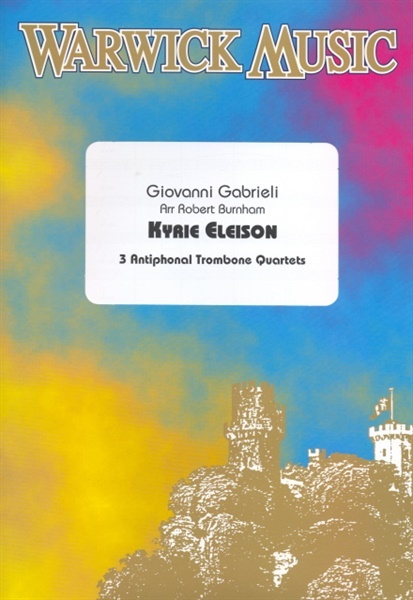 This lush arrangement for three trombone quartets is a good choice and reasonably priced.